1st row: Sharon Barnes, Helen VanBrocklin, Vivian O’Brien, Elaine Gollinger, Linda Cloe, Helen Lou McKee. 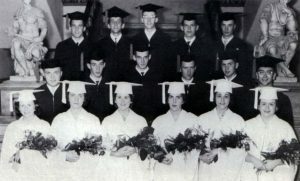 2nd row: Robert Todd, George VanBrocklin, Belden Whitmarsh, Max Hill, John White, Gary Hutchinson. 3rd row: Frederick Cook, Robert Johnson, Charles Foster, Horace Law, Steven Grant.